AACSB reports can only be enabled upon request of an institutional administrator to their project manager. Not all databases have the AACSB credential reports enabled. 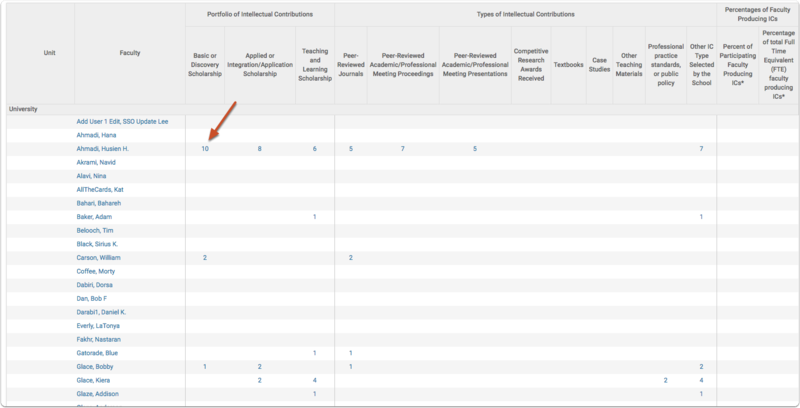 VERY IMPORTANT- Updating your Scholarly Contributions mapping? 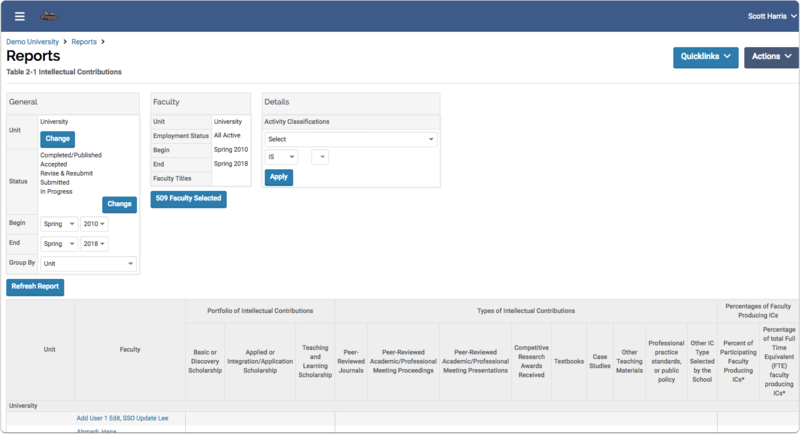 If your institution has changed the mapping of scholarly contributions since May 2018, then you must reach out to your Interfolio project manager or to help@interfolio.com to have our engineers update your AACSB table. If your institution used Interfolio's report and activity classifications/faculty classifications for 2013 AACSB, than as of May 8, 2018, you have the 2017 AACSB report and classifications. For example: You must use the 2017 classifications with the 2017 report, information assigned a 2013 classification will not appear in the 2017 report. Scroll down to the AACSB Reports and select the most up to date version (2017) of the table that you desire. On the report setup page for 2-1, enter in the relevant information. Select how you would like the info to 'Group by'. The option selected in the 'Group by' will determine how the individual faculty members are organized. 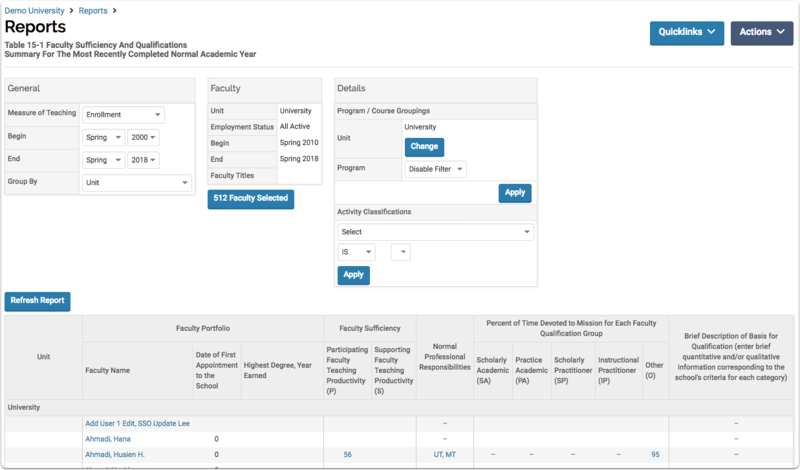 For instance, if you choose Program, all faculty members will be grouped with fellow program members for comparison and statistical grouping. 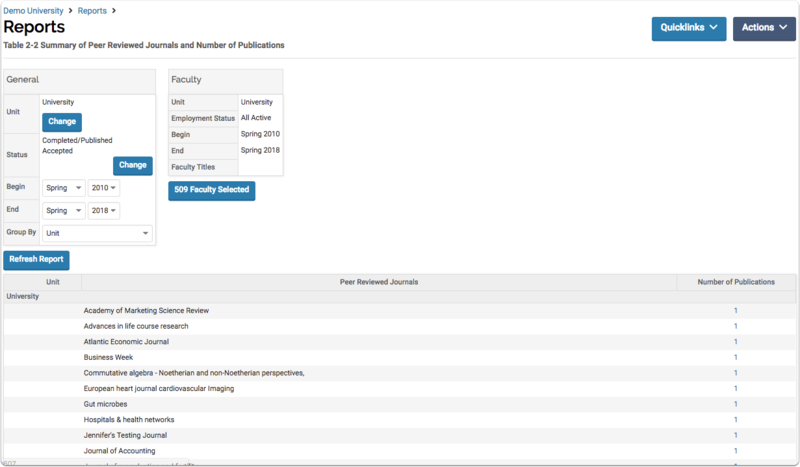 In the Faculty Field, Choose what faculty members you would like to observe in this report. After you have trun the report, the results will display below the settings/fields. In this report, all faculty are grouped by unit, in the columns are the different criteria and metrics relevant for AACSB 2-1 report. 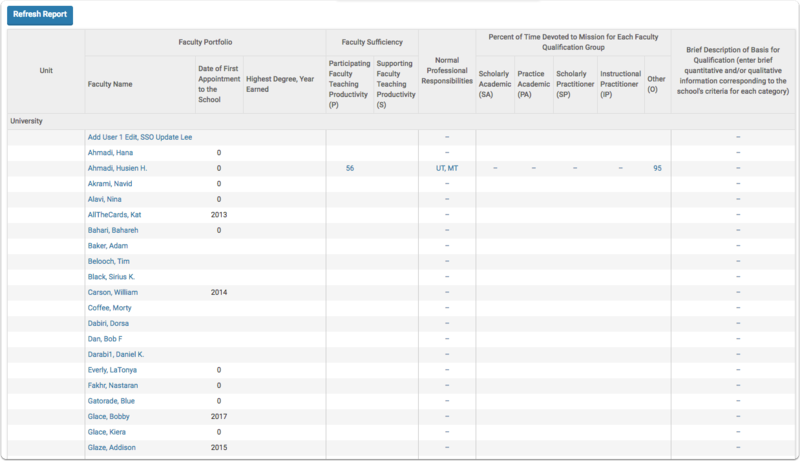 We sum the FTE rating of all faculty within the report across the time periods selected in the report and generate the average faculty FTE over that period. Click on a name or number value to dive down into the data. After the page loads, the results that fit into the selected criteria will display. Click the Edit Pencil to dive down further and see more info about the record. 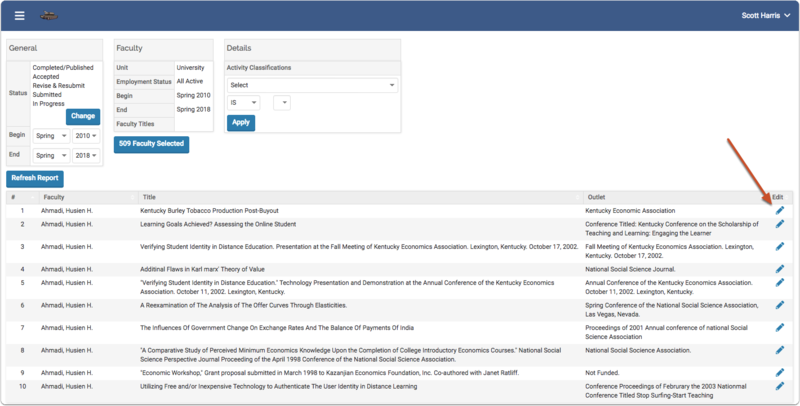 After the page loads, you will be on the Activity Input form to look at the specific information relevant to the selected activity. 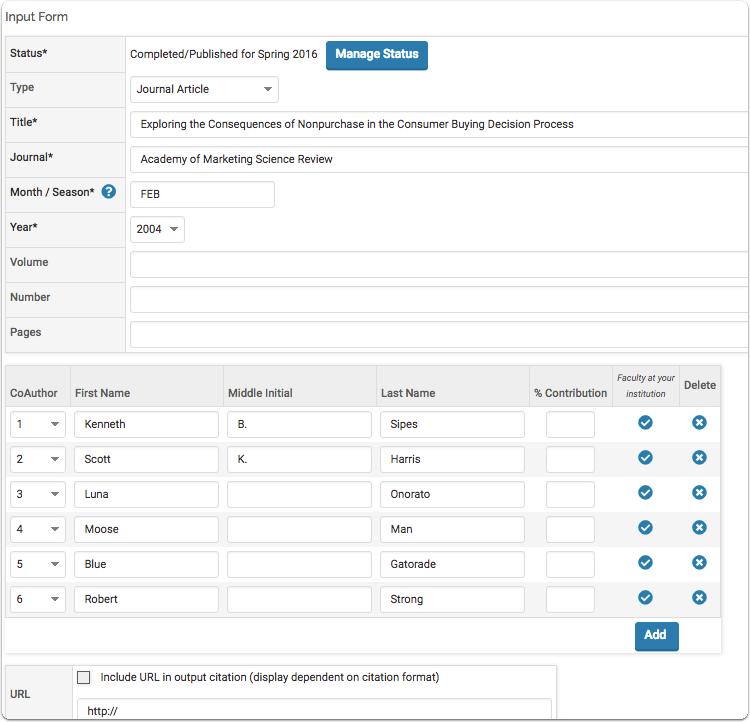 After navigating to the reports page, fill out the relevant fields to get the desired data for your search. When finished click Build Report button. After the page loads, the results will be displayed below the fields you configured. Click a linked value to dive farther into the data. In this example, the information is displayed in groups relative to their unit, based on the 'Group by' field. After the page loads, you will be able to see each individual record for the value. In this example, there was only one record in this grouping. The record, in it's entirety, is displayed and can be analyzed by the user. Choose how you would like the data to be grouped by. Program/Course Groupings will display relevant programs at the given Unit. 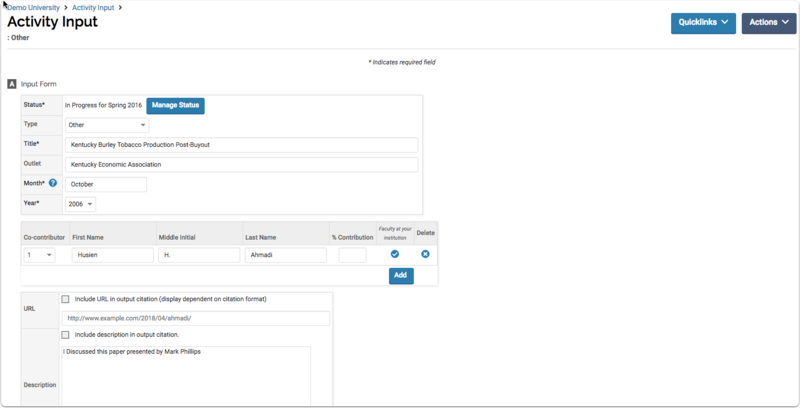 After clicking Build Report, the results will display below the configurable fields. You can dive into the data by clicking a link within the table. Clicking on a name will show you a vita with the relevant information for the relevant user. Selecting a value will display all activities that make up the selected value. After navigating to Table 15-2 (2017) from the Reports page, you will see the configurable fields in the image below. Choose the relevant details for your desired report. 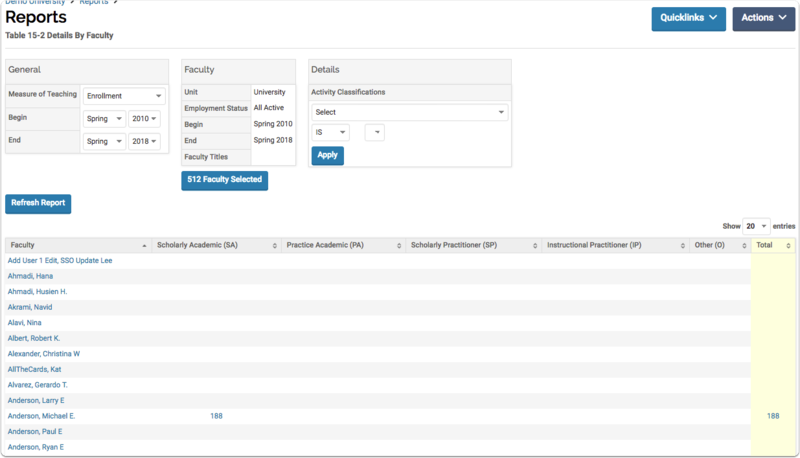 Then choose a relevant grouping of faculty in the faculty section. After you click build report, the results will display at the bottom of the page. 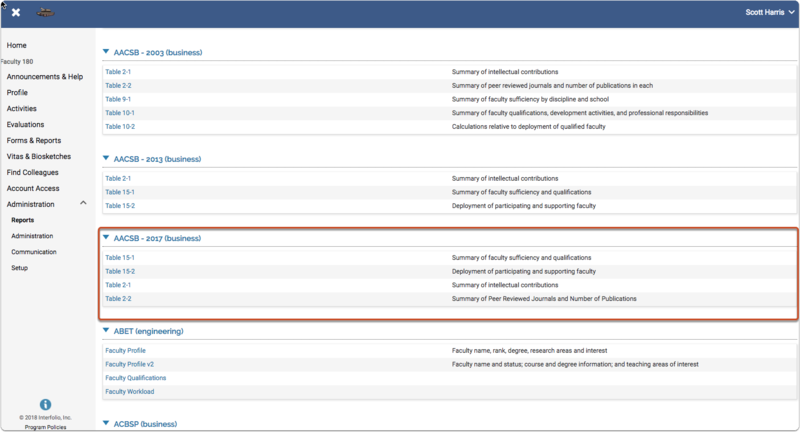 Clicking on the 100% or percentage value, all relevant faculty that make up that value will be displayed. 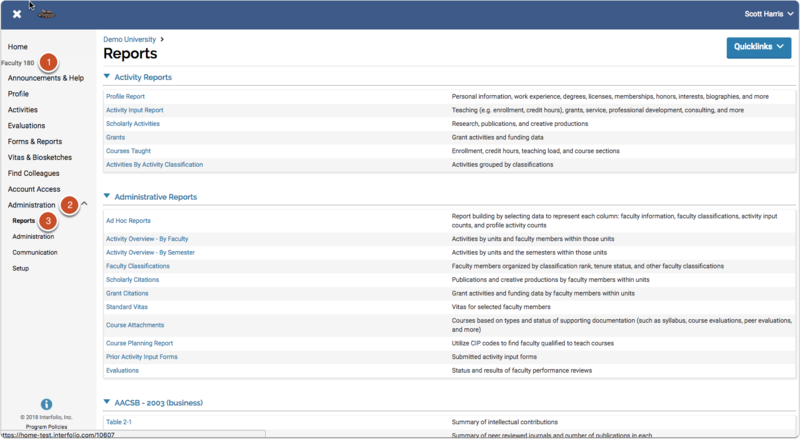 Users can use Quicklinks to save and share your report within Faculty180. 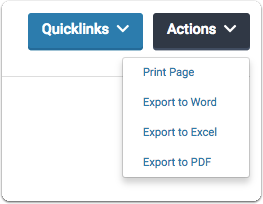 Users can also use the Actions button to Print or Export to Word/Excel/PDF.